Fortnite's Team Rumble mode is here! First team to reach 100 Eliminations in this Limited Time Mode wins! Find out more about player respawn, eliminated player drops, & more! Team Rumble will have players fighting in teams of 20 players in a race to get 100 eliminations! It's a free for all - players can respawn unlimited times after 5 seconds and get to keep their inventory! 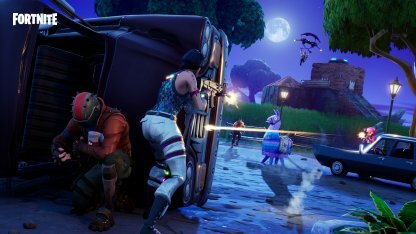 This LTM is a dynamic action-packed experience where players are encouraged to get aggressive and work together to eliminate 100 players from the opposing side. Players need to team up & accumulate 100 eliminations to win the match in Team Rumble. It's a race against the other team to see which one can eliminate the most enemies! In this Limited Time Mode, respawn is available. Players respawn 5 seconds after getting eliminated. You'll get to keep your loot and retain your inventory even if you get eliminated & respawn so you can keep going back to the fight! Players you eliminate will randomly spawn ammunition or materials such as 120 Wood, 90 Stone, 60 Metal. Be sure to pick these up to build protection when you get under fire. In Team Rumble, Uncommon weapons and higher will be yours to loot. This ensures that you can deal a lot of damage and eliminate more opponents to help your team. In Team Rumble, you get player respawn and eliminated players spawn ammo or materials, don't be afraid to be on the prowl & aggressively hunt enemy players. The purpose of the LTM is to reach 100 eliminations so it's best to be proactive! Keep with your team mates! Working together to eliminate opponents will be much faster and more efficient. You can also cover more ground and each other's backs from possible ambushes & snipes! Due to the availability of player respawn, this is a great game mode to complete your challenges, get more XP, and earn more Battle Stars!